Summer often brings potential hazards for outdoor runners. Find out how to avoid, tackle or navigate these pitfalls – some of them may surprise you! When the sun’s out, fair-weather cyclists take to the roads and cycle paths. You may find yourself sharing cycle paths, byways or canal towpaths with more cyclists than usual, and many of them might be children, or inexperienced, unconfident adults. So take care and take responsibility. If you must wear headphones, make sure the music is turned down low enough that you can hear bikes coming up behind you. If you are running towards a cyclist, clearly signal (with your hand) which side you are going to pass them on, then run confidently on. If the cyclists are very young or look very wobbly, consider slowing down or even stopping to let them pass. Dog walkers enjoy longer walks and rural rambles on dry days. Although they ought to put pup on the lead (or make him sit) when a runner is approaching, many will not. If you are wary of dogs, or of this dog in particular, you are well within your rights to stop, and politely ask the dog owner to call their dog to heel and/or put him on the lead so you can pass. If you are OK with dogs, run confidently past and don’t make eye contact with the dog or make any gesture which he could misconstrue (hands in pockets can mean “biscuits”!) If the owner does control the dog, be sure to say a quick “thank you” as you pass. Ugh, there’s nothing more frustrating than a humid Summer run accompanied by flies, midges and other buzzing beasties. If you know that your local running route is prone to midges, avoid it during particularly hot times of the day. Canal banks, lakes and ponds are common culprits. Invest in some insect-repellant wipes (not all of them contain deet) and wipe your arms, legs, chest and shoulders before you set off. You could even tuck one into your shoulders strap or waistband. Try spraying a running cap with insect-repellant before you set off (spray it before you put it on). This should keep the worst of the buzzies away from your eyes and mouth. If you’ve ever had heatstroke, you’ll know how horrible (and potentially dangerous) it is. Do everything you can to avoid it in the first place: keep very well hydrated during the day, and start every run properly hydrated. Take water with you (in a camelbak or similar device) or stop for water along the way if you’re on a long run. Protect your face with a cap, and wear cool running kit which wicks sweat. Run in the shade wherever possible, and avoid the hours of 11am-2pm if you can. 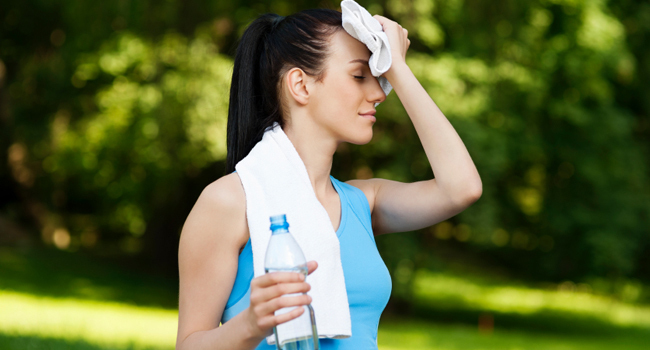 If it’s really hot, soak your running hat and even your t-shirt in cold water before setting off. If your run takes you off-road, the hot weather might turn footpaths into dry gravel and grit which you kick up as you run. What’s the problem with that? Try running with a tiny chip of stone down your sock and you’ll soon find out. To combat this small but oh-so-annoying problem, try wearing long, tight socks (such as compression socks).